Accurate Garage Door Repairs of Las Vegas NV can provide you the necessary garage door repairs including garage door motor repairs, broken springs, cables, pulleys and drums, noisy garage doors, offtrack garage doors, opener replacements, and new garage door openers if needed. We ensure that the service we provide for your garage door is second to none. Don't trust your garage door to just anyone let Accurate Garage Door Service impress you by showing you. We service all brands of garage door products including the list of garage door companies below: Amarr, Martin, Clopay, Chamberlain, Craftsman, Genie, Liftmaster, Marantec, Raynor, Stanley, Wayne-Dalton, Windsor, Sears and more. If you need garage door repair we are here to help. The most common problems many homeowners experience with their door is broken springs, opener repair and doors off track. 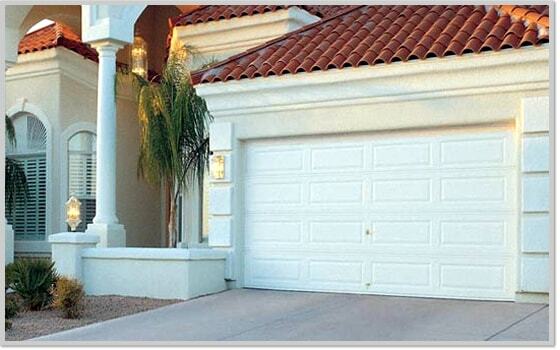 No matter what your repair need is Accurate Garage Door Services of Las Vegas can help you with that. The most common garage door repair requested is spring replacement and repair. The garage door spring is the single most important and the most dangerous component on your garage door. There are typically two types of garage door springs - torsion springs and extension springs. The most common type you will see is the torsion spring. Broken garage door cables are also a common problem. The garage door cable is what carries the weight of the door to the bottom section and lifts the door with the forces provided by the spring. Broken cables will often appear to be a problem with your opener or may cause your garage door to come off track and get sideways in the opening.